The San Mateo Masters is a USMS Masters Swim Team with 240+ swimmers ranging from age 18-95. We are recognized as the 1st Masters Swim Team in the United States. Our swimmers come in all different shapes, sizes, and abilities. We encourage you to come try us out! Contact Coach Tom for your complimentary workout here. It is actually very simple… We are an organized, supportive group of swimmers (ages 18+), coached by experienced, motivating and supportive coaches. We come in all shapes and sizes, and all levels of efficiency. We swim for fun, we swim to meet new friends, we swim for exercise, we swim for competition, and some swim for all of the above. But mostly, we swim for our health and well- being. Come and swim with us…it’s that simple. All members are welcome to try a complimentary swim workout with us. We invite participation from swimmers of all abilities, age 18 and over who are interested in regular structured workouts. Experience in competitive swimming is not necessary. Members include beginning lap swimmers, triathletes, former collegiate and nationally-ranked Masters competitors. We are one of the few bay area programs with access to long course training, an element that gives us an extra edge in training variety and opportunity. I was born in San Francisco and raised in Millbrae. I started swimming at the age of 9 for the Millbrae Otters. Eventually the Otters merged with the San Mateo swim team, and we later became the Golden Gate Aquatics swim team. I was a top five U.S. age group swimmer, and I continued swimming until I was 18. I was offered a number of college swimming scholarships, but unfortunately I was burned out, and I stopped swimming after I left school. Soon after that I began my career in the entertainment field and eventually moved to Los Angeles. It was during this time that I found my way back to the pool. I started swimming with a Masters team, never thinking that I would start competing again. But I found that I still had that competitive gene in me, and I really started training hard. I was shocked and excited to find that my body still responded to the intense workouts. Over the next 20 years or so, I achieved Masters World and National records as well as All-American honors, and I also discovered that I had a passion for coaching. Having been asked to fill in as coach for the Masters team from time to time, I found that I really enjoyed doing it and I started coaching on a regular basis. So swimming and coaching have been a very big part of my life. I am so fortunate and excited to be doing what I love … coaching. And to be back in my home town coaching the San Mateo Masters is something I would have never expected. The San Mateo Masters has the honor and recognition of being the very first Masters swim team in the world, and I am lucky to be part of that history. At the age of nine Jim began swimming competitively for the Golden Serpents Swim Club in Michigan. He has remained in the sport ever since. Jim started coaching in 1984 at the University Club in Lansing Michigan. From there he became the Aquatics Director at the Little harbor Club from 1985 – 1987. After the birth of his children, Jim took a brief hiatus from swimming but started competing again in Masters in 1999. 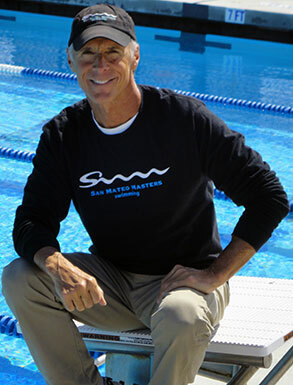 Jim loves coaching and enjoys working with entry level swimmers focusing on building a solid stroke and technique and developing a foundation that will serve athletes over the course of their swimming career. Jim has developed athletes at the Mavericks swim team in Half Moon Bay and was Head Coach at the Burlingame Country Club from 2008- 2011. Jim was also Assistant Coach at Carlmont High School in 2012 and made coaching contributions that helped lift Carlmont to their first PAL BAY Division title while developing athletes to achieve personal, school and conference records. Jim has become an important part of our coaching staff. Megan Waters grew up in Rockville, MD, swimming for her summer league and local club teams since the age of 8. After working her way to becoming an All-Ivy competitor, record holder and NCAA qualifier in the 50 and 100 free for Princeton University, Megan stayed in Princeton an extra year to train for and compete in the 2012 U.S. Olympic Trials. Following Trials, Megan retired from the great sport of swimming and has since taken up yoga, rock climbing and skiing to sate her competitive edge. Throughout her childhood, Megan coached for both her summer team and local country club. Upon entering college, Megan began bolstering her breadth of knowledge and experience in coaching by spending summers working for successful swim camps like Michigan and Longhorns Swim Camps in Ann Arbor and Austin. Her interest in the technical side of the sport led her to pursue coaching on the collegiate level. After spending two years as Assistant Men’s and Women’s Coach at Denison University in Ohio, Megan returned to coach club swimming for a year in Virginia as an age group coach and swim school competitive lesson instructor. Megan is now living in San Mateo and working full-time for the San Mateo County in water conservation. 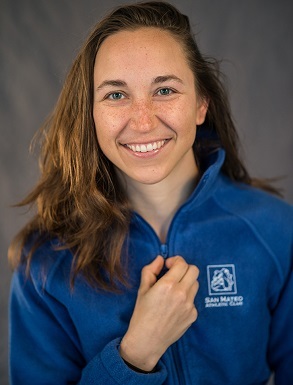 She is excited to be able to share her years of coaching and swimming experience part-time with the San Mateo Masters swim team.